Reference number for this case: 7-Oct-54-Corbigny. Thank you for including this reference number in any correspondence with me regarding this case. French ufologist Aimé Michel reports that on October 7, 1954, in Corbigny, in the Nievre, witnesses twice see an object corresponding to the description of a large vertical cigar, a sort of luminous cylinder of weak luminosity, orange when it is motionless and in vertical position, and white with a strong luminosity when it goes in horizontal position. At a certain time, two small discs came out of its lower part. 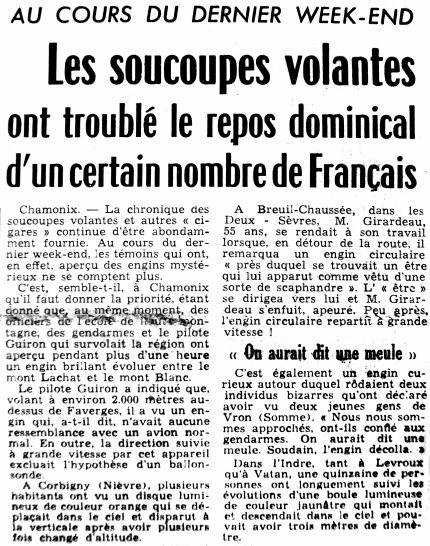 The author indicates that on October 7, 1954, luminous discs, landing or not landing, were reported among other places in Corbigny. The two authors indicate that in Corbigny in the department of the Nièvre on October 7, 1954, by day, a luminous machine in the shape of a cigar carrying at its lower part two red discs as well as a luminous disc of large dimension and of orange yellow color, going at a vertiginous speed, leaving behind him a dazzling light, was observed. The machine was of cylindrical shape and emitted red and orange gleams. The source is indicated as La Montagne for October 8, 1954. The Belgian ufologist indicates that on October 7, 1954, in Corbigny (Nievre), "Daylight observation. A luminous machine in the shape of a cigar carrying at its lower part two red discs. A luminous disc of great dimension and orange yellow color going at a vertiginous speed, leaving behind it a dazzling light. Cylindrical craft emitting red and orange gleams." She indicates that the source is "M. FIGUET/ J.L. RUCHON: 'Ovni, Premier dossier complet...' Alain Lefeuvre pub. 1979, p. 133". October 7, time unspecified, Corbigny (Nièvre Department). The witnesses twice saw an object that corresponded to a cloud cigar. It was a kind of luminous "cylinder," with a faintly orange light when vertical and motionless, a strong white light when moving forward horizontally. At one point, two small disks were seen to leave the lower part of the object. Luc Chastan indicates that in the "Nièvres" in Corbigny on October 7, 1954, at an unknown hour, "In full day a luminous machine is observed, in the shape of a cigar carrying at its lower part two red discs as well as a luminous disc of great dimension and orange yellow color going at a vertiginous speed, leaving behind it a dazzling light. Craft of cylindrical shape emitting red and orange gleams." The website indicates that on 6 October 1954 at night in Corbigny, France, "Nocturnal lights were reported." The website indicates that on 7 October 1954 at 19:00 in Corbigny, France, "Cigar-shaped objects were observed. Three cigar-shaped objects were observed by six witnesses on a farm. Explanation: Coincidenc." The day of October 7, 1954, observations, are announced in Herbourg [sic, Cherbourg], la Ferté-Macé (61), close to Saint-Jean D'Assé on main road 138, in Ballon, Lavenay, Montlevic and Cassis. These appearances are along a line with a millimetre-length precision. The same thing for Corbigny, Montlevic, Puymoyen and Marcillac i.e. on the whole 28 localities which were the theatre of demonstrations, which showed same docility to be lined up on straight lines. This at the very least strange fact was repeated curiously during the first fortnight of October. After that the wave calms down. [am1] "Mystérieux Objets Célestes", book by Aimé Michel, Seghers publisher, France, pp 196-197, 1958. 1.0 Patrick Gross May 1, 2009 Conversion from HTML to XHTML Strict. First formal version. Additions [go1], [lc1], [ud1], [ud2]. 1.4 Patrick Gross December 20, 2016 Additions [mr1], [ub1]. 1.5 Patrick Gross January 3, 2017 Addition [fs1].